The DISA Cyber Awareness Challenge 2018 is now available!! This training replaces the previous Cyber Awareness Challenge Version 4.0! This one was updated last week. We are sorry for the late post! This revised version of Cyber Awareness Challenge provides enhanced guidance for online conduct and proper use of information technology by DoD personnel. This training simulates the decisions that DoD information system users make every day as they perform their work. Rather than using a narrative format, the Challenge presents cybersecurity and information systems security (ISS) awareness instructional topics through first-person simulations and mini-game challenges that allow the user to practice and review cybersecurity concepts in an interactive manner. The introduction explains that information system users are responsible for protecting sensitive and classified information, as well as the information system on which this information resides. In the introduction, users are presented with the types of decisions they are expected to make throughout the Challenge and the consequences of their decisions in the scoring mechanisms. As a user makes these situational decisions, the user is introduced to threats associated with spyware, malicious code, phishing, identity theft, and the insider threat, as well as what to do when encountering classified or sensitive documents on the Internet. Users experience the importance of maintaining information security situational awareness when out of a secure area. Does the 2018 version of the Cyber Awareness Challenge IMMEDIATELY take the place of Version-4 or when the version 4 certifications expire? Where and what is guidance on this change? Yes, soon as a new training is available, that is the latest and greatest one for that FY. What is the difference between the IC and DoD versions of the Cyber Awareness Challenge? We’re looking for a General User Training program. I took the challenge but couldn’t find out how to print my certificate? Then it kicked me out. Now what do I do to retrieve my certificate? That happened to me, on our cheat sheet it states if this happens we may have to take it all over. I am not a happy camper either. Yes, unfortunately, you have to start all over. We don’t know when or if DISA will fix that anytime soon. Does this training supersede the DOD-IAA-V13.0 training ? Yes this is the most up to date training provided by DISA. Yes this is the most up to date training that DISA has provided. Is there a test for this training? How are test scores and certificates retrieved? Test scores, certificates and AUPs are need for account creation. The IA Training doesn’t have a “test” per se’. You are asked questions along the way. 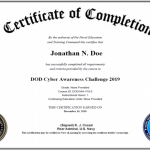 I completed the DoD Cyber Awareness Challenge training on 3/12/2018. But when I login on 3/14/2018 to take the test the system is not allowing me to go directly to the test. Once you take the training, you will have to print out your certificate. Do you still need to take the test to get the Army cert, and if so, how do you get to it now? This training will give you a DOD/DISA IA Training Certificate. I have a requirement to complete Annual IA Awareness Training. Can you please direct me to the right course that will meet this requirement? Now my personnel are getting a message from TWMS that Version 5 is the most current version of DOD/DISA I/A training? When did that become required? Each October a new version of the IA Training is released! This does not list that it is version 5 on the certificate of completion. Why is that? 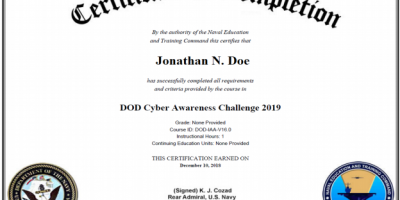 Does this replace the Annual DoD Cyber Awareness Challenge (V 4.0Training) that was issued online through U.S Army Signal Center, given at Fort Gordon, Ga?